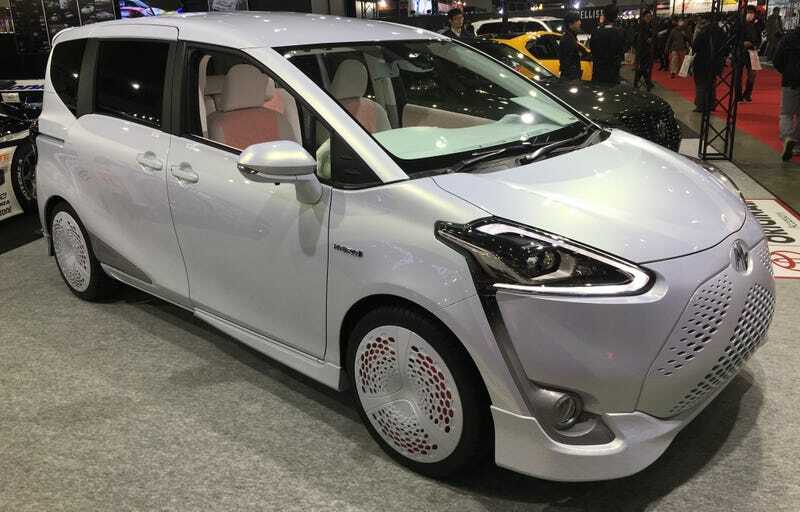 Frankly, Toyota, I have no idea what is Toyota Racing Development about this StyleMB Sienta concept, as it kind of looks like the car version of a stuffed hippo. In serious consultation with our stuffed animal expert, Stef Schrader, we have determined this is clearly a special TRD project for Puffalumps. Now, seriously, with a face like that, can you honestly tell me it doesn’t look like a hippo? Or maybe some kind of hornless Rhino? The headlights as the eyes, the grill as a big whiskered nose, and the side mirrors as cute little flapping hippo ears? Yeah, you’re following me on this. The general shape is even, uh, hippo shaped, right? RIGHT? I’m not alone here, am I? No, no I am not. And if the color, the shape, and the front end didn’t look stuffed animal enough, well... the interior, folks. Now, how fluffy can you get?! This isn’t the minivan you get for you. This isn’t even the minivan you pretend is a crossover and load up with special options like spoilers, front and rear lips, side skirts, and rims, so you’re the “cool” mom or dad. No, this is the minivan you buy blatantly and unapologetically for your five year old who demands stuffed animal tea parties everywhere and always.